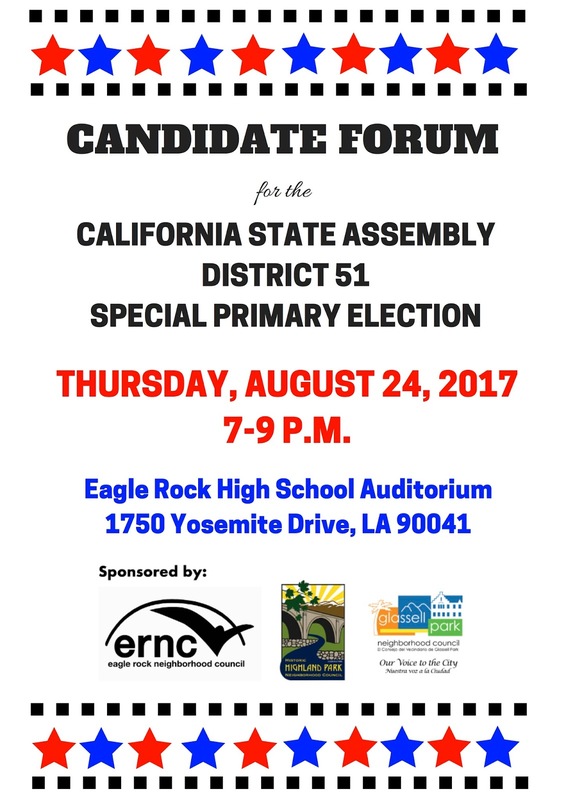 We are officially on ........, 51st Assembly District Special Election Campaign Watch, as the 13 Qualified Candidates seeking to replace, NOW Congressman Jimmy Gomez, have been invited to a Thursday Evening (7-9 PM. 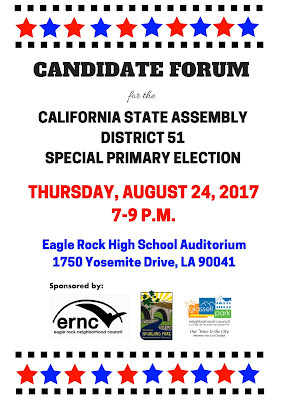 ), August 24, 2017 Candidate Forum at Eagle Rock High School. ** Blogger's Notes: Tomorrow's first mass gathering of Qualified Candidates seeking to replace the, NOW 434th-ranking Congressman Jimmy Gomez, is a GREAT opportunity to make cyber notes on the 2017 51st AD Special Election Scorecard. 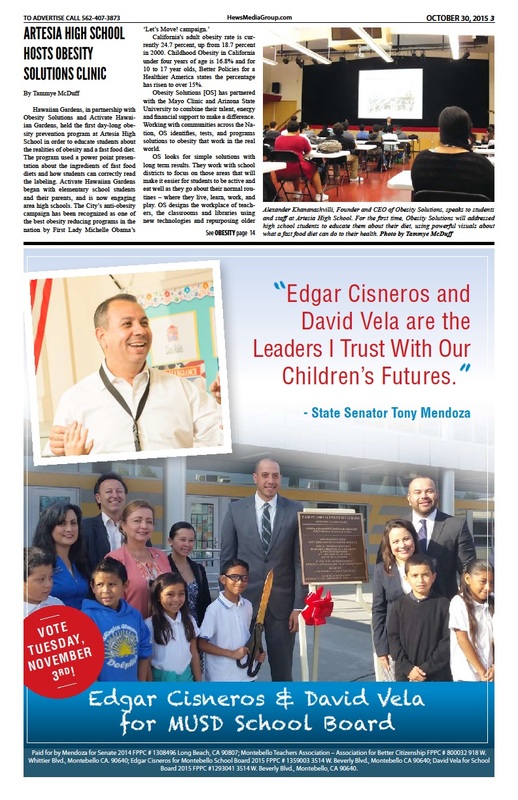 Briefly, the early election handicapping has second-time 51st AD Home Grown Candidate Luis Lopez in the Top-Two-Tier, with the rest of the field fighting among themselves to place second on October 3 ......., and move on to a December 5 Runoff. We will provide an in-depth Handicapping of the Candidates after tomorrow's gathering-----Scott Johnson. 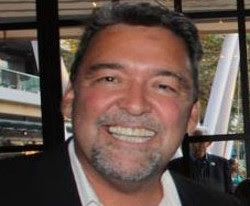 In an under-reported conclusion to a stealth 2011 CD-14 Election Scandal, three former Executives of the Connected Non-Profit Chicana Services Action Center ......., pleaded GUILTY August 15 to embezzling millions of dollars from the Community Based Organization (CBO), financed by grants from the County and City of Los Angeles. 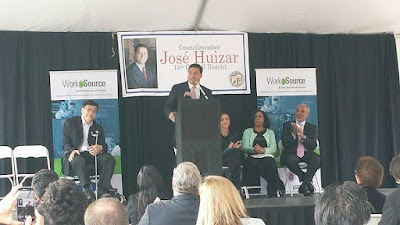 CD-14 City Councilman Jose Huizar at the 2014 Dedication of Chicana Services Work Source Center in Boyle Heights, financed in part by a $440,000, Councilman Huizar-secured City Grant. ** Blogger's Notes: If there is ONLY one department at the Internal Revenue Service that merits an increase in employees, it would be the unit responsible for the needed auditing of Connected 501-C3 Non-Profits, especially those in Democratic-controlled Enclaves, such as Ciudad de Los Angeles. 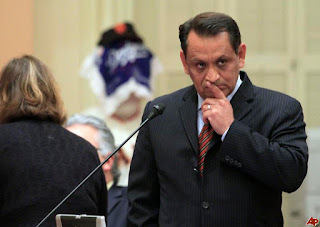 In an UNDER-REPORTED conclusion to a Fraud Investigation, with links to former LA County Board of Supervisor Gloria Molina and CD-14 City Councilman Jose Huizar, three former executives of the Chicana Action Services Center, PLEADED guilty to embezzling million of dollars from the coffers of the connected CBO, financed in LARGE part, from LA County and City Grants. 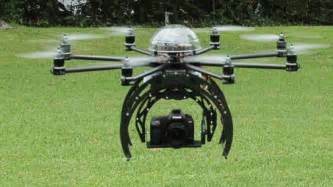 The Los Angeles Police Department (LAPD) wants YOU to give input on a proposed Pilot (less) Program to deploy Drones as a Crime Fighting Tool throughout the City of Los Angeles ......., via Public Meetings this evening (Wednesday) at four locations city-wide. Say HELLO to your friendly LAPD Drone on three. ** Blogger's Notes: We never ignore an opportunity to empower our cyber audience to become engage in the civic dialog, especially when the subject involves Public Safety. This evening (Wednesday), LAPD is hosting four public meetings city-wide that allows YOU to give input on its proposed Pilot(less) Program to deploy Drones as a Crime Fighting Tool. We normally don't resort to Gambling as part of our bloggin discourse ........, BUT we would wager a Chief Charlie Beck-purchased Horse (for his Mounted Unit-assigned Daughter), that supposed "Civil Libertarians (that resemble the same Black Lives Matter/Antifa/Brown Berets/White Leftists types that frequent LAPD Police Commission Meetings), will be LOUD participants at tonight's gatherings. Below, we post the locations and other useful specifics via the Daily News-----Scott Johnson. All members of the public may attend the meetings and provide input. The meetings will begin at 6:30 p.m. Wednesday at these locations:• Marvin Braude San Fernando Valley Constituent Service Center, 6262 Van Nuys Blvd., Van Nuys• Friendship Auditorium, 3201 Riverside Drive, Los Angeles• Peck Park Recreation Center, 560 N. Western Ave., San Pedro• Westwood Recreation Center, 1350 Sepulveda Blvd., WestwoodCommunity members who are unable to attend the meetings may send their comments via email to SUASlapd.online; or by mail at Los Angeles Police Department Office of Special Operations, SUAS Pilot Project, P.O. 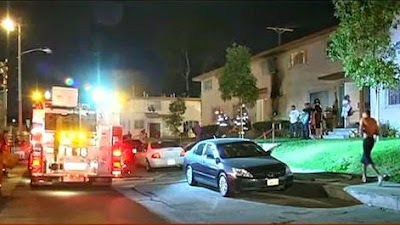 Box 30158, Los Angeles, CA 90030. 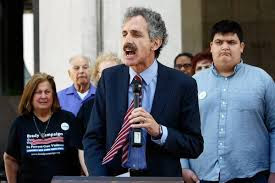 Never to let an opportunity (Charlottesville) for self-promoting grandstanding go to waste, City Attorney (and Co-author of Cop-killing/endangering AB-109 Legislation) Mike Feuer, espouses Rally Permits Denial for "Hate Groups (established code-phrase for Republican Groups?)" as he feigns Convenient Ignorance of recent Acts of Hate, along with Speech Suppression ........., by Non-Whites in Southern CD-14. ** Blogger's Notes: On this Tuesday, August 22, 2017, History will note that Los Angeles City Attorney Mike Feuer officially-sided with protecting the Interests of Illegal Immigrants, while days before, espousing that the "Gathering Rights" of supposed "Hateful Americans", be denied. Its a tired practice of aspiring Career Politicos (as exampled by the former Bet Tzedek Executive Director), to GRANDSTAND (specially when the local "Fishwrap of Disinformation ....., on Spring Street", concurs) on a Policy Issue that will garner like-minded support, increase name recognition ..........., and cover up (NAUGHT) the DAMNING FACT that the City of LA's Top Lawyer was the CO-AUTHOR of Cop-Killing/Endangering AB-109 Prison Realignment Legislation. Another Implosion of Leadership at "The Old Gray Collectivist Hag on Spring Street (aka. LA Times)"
In yet another Implosion of Leadership at the bloggin-bestowed, "Old Gray Collectivist Hag on Spring Street (aka. LA Times)", Publisher/Editor Davan Maharaj and three other top editors have been purged in the latest Corporate Makeover, that forlornly endeavors to raise the supposed journalistic standing of a current "Fishwrap of Disinformation". Another self-produced, Leadership Implosion on Spring Street. ** Blogger's Notes: Paraphrasing from "The Old Collectivist Hag on Spring Street's (aka. LA Times) latest myopic, editorial rant targeting President Donald Trump, Enough is, TRULY Enough ........, regarding the, NOW past egomaniac (and alleged Bill Clinton-like behavior) reign of its purged "Publisher/Editor Davan Maharaj. Its a Mayor Sam Bloggin Tradition that when the "Old Gray Collectivist Hag", becomes THE NEWS, we defer to the cyber-attribution of the "Westside White Guy (or Pulitzer for short)", in providing the INSIDE on the latest, Newsroom or Corporate-originating PUTSCH of its top leadership. 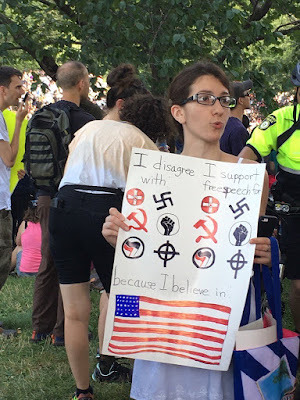 From the First Amendment: Congress shall make no law respecting an establishment of religion, or prohibiting the free exercise thereof; or abridging the freedom of speech, or of the press; or the right of the people peaceably to assemble, and to petition the government for a redress of grievances. A Teachable Moment for ALL Americans. 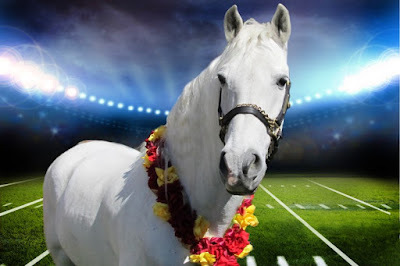 As the Student Body of the "University of Scholastic Compromise (USC)" under the CONTROL of President Max Nikias), returns for another expensive year of quality indoctrination, the Mayor Sam Blog proudly offers this FREE bloggin Teachable Moment on the subject of "A Horse Named Traveler (with one L)". 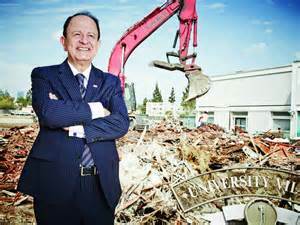 The MASTERMIND of Communal, Educational, Ethical Deconstructing and enabler of Medical School Dean's Drug Use Safe Space at the "University of Scandalous Conduct", President Max Nikias. A Horse/Mascot named Traveler (with one L). * Note Traveler's PURE WHITENESS that former School President (and Eugenics Supporter) Rufas von KleinSmid, would of found genetically proper. A Much Needed TGIF Bloggin Satire Featuring Joe ........, and Introducing "Joesito Cedillo McCarthy"
In the spirit of celebrating a much-needed TGIF (and Satire), we are bloggin proud to reconnect two kindred political souls who have strayed in opposite directions from the epicenter of creation, only to be reunite here for ............, the sake of laughing at their shared follies. Career Leftist Politico and current CD 1 City Clowncilman "Joesito Cedillo McCarthy". ** Blogger's Notes: Lets all come together across the Free Cybersphere in proclaiming ......., THANKS GOD ITS FRIDAY (Disclaimer: Any complaints about the use of GOD can be directed to your local BLESSED ACLU Office). In a week that saw the Political Left/Media (along with castrated Republican Establishment types) engaged in Orwellian Double-Speak and preview their pending AmeriKan Taliban Intolerance, in regards to symbols denoting inconvenient historical episodes, we endeavor to bring UNITY IN THE COMMUNITY ..........., with bloggin Satire. 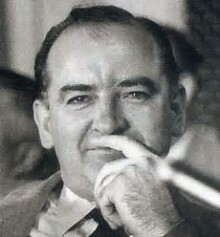 As a decades-long dispenser of Establishment Agenda Journalism (on Spring Street) continues its devolution into a factually-challenge, Newsprint of Disinformation, its singular-bias (against all things Conservative), assemblage of, MOSTLY Anglo Propagandist/Revisionists, are myopic to the FACT, that they are now the ........., "Alt(ernative Facts) Left Fishwrap of Record" in Los Angeles. The Alt(ernative Facts) Left Fishwrap of Record on Spring Street's Journalistic Integrity imploding from within. 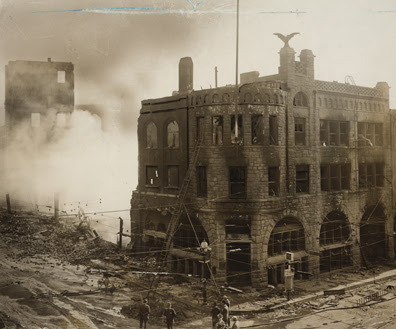 ** Blogger's Notes: Disclaimer: The use of the above photo, taken in the aftermath of the Trade Unionists Bombing of the Los Angeles Times in 1910, is use as TEACHABLE TOOL in noting what we believe is the continuous, imploding Journalistic Integrity of a supposed "Newsprint of Record (on Spring Street)" ....., and is NOT an endorsement of any nefarious conduct targeting Times property or staff. That stated, we are troubled that the supposed "Newsprint of Record (on Spring Street's)" continuing devolution into a mere propaganda/disinformation tool for the Political Establishment, has reached a subjective level, where it has become a keyboard weapon dispenser of "Wanton Missives of Distortion (WMD's)" for the interests of the "Alt(ernative Facts) Left" in Los Angeles. In a Monday Update to our last week's Los Angeles Community College District (LACCD) missives, we can report that the Board of Trustee's voted 4-3 (with Trustees Steve Veres, Gabriel Buelna, Andra Hoffman and Board President Sydney Kamlager affirming) to award Pacific Services its Bond Construction Oversight Contract (despite its higher-priced Bid), disregarding its past, DOCUMENTED repugnant corporate behavior. The NOW-anointed LACCD Board of Trustee Member Steve "Pacifica Pervy Enabler" Veres. ** Blogger's Notes: On this evening where the removal of Confederate History, is exposing the "Inner-Taliban" of supposed tolerant Progressives, we can report that the LACCD Board of Trustees Majority of Steve Veres, Gabriel Buelna, Andra Hoffman and Board President Sydney Kamlager together created "A Hypocritical Monument to Self (for instantaneous repudiation)", via their granting of the latest LACCD Construction Bond Oversight Contract to the NOTORIOUS Pacifica Services. As the Local Political Establishment (including CD-14 City Councilman Jose Huizar) parrots the Main Stream Media's (MSM) condemnation of President Donald Trump over Saturdays despicable events in Charlottesville, Virginia, we bloggin note the DOCUMENTED lack of rapid repudiation to past Racial Attacks in CD-14. The Scene of Firebombings of African-American Families in Ramona Gardens. ** Blogger's Notes: So damned predictable ........., again. It never fails that when two repugnant factions of the Racist Left (Nazi/Klan Kluckers vs. Communists/Anarchists/the ANTIFA Group/Black Lives Matter) collide at the crossroads of a protest, the innocent get hurt (or tragically killed) and Political Hypocrisy REIGNS ..........., especially if the President happens to be a Republican. A Special GOTCHA Edition of ............, "Ask a Fake News/Propagandist Muckraker, featuring Brian Hews (or Legal Counsel)"
Its bloggin time for a special GOTCHA Edition of "Ask a Fake News/Propagandist Muckraker, featuring Brian Hews (or $250 per hour Legal Counsel), with questions GALORE, compliments of today's LA Weekly Story via Hillel Aron regarding ..........., "How a Small Newspaper Became a Big Weapon (for the Chacon Political Machine, allegedly)". The alleged WEAPON that is the Fake News/Propagandist Muckraker for Ad Revenue (or the Chacon Family Political Agenda) Brian Hews. Did former Montebello Unified School District Board of Education Colleagues David Vela, Edger Cisneros and Hector Chacon, support $27,000 in payments (for ads and legal postings) to the Hews Media Group, in return for positive newspaper coverage, endorsements (yes) .........., and factually-challenged attacks on political opponents? ** Blogger's Notes: With no apologies to the supposed "Old Gray Anti-Trump Journalistic Pea-shooter on Spring Street (aka. LA Times)", we want to commend the, AGAIN "Weekly of Record (aka. LA Weekly)" for its GOTCHA Exclusive on the Brian Hews/Los Chacon News, formerly respected as the Los Cerritos Community News. The LA Weekly's Scribe Hillel Aron is to be lauded for his expansive, objective missive, regarding the DEVOLUTION of a once, award-winning Community Newspaper, into a mere, "WEAPON OF PROPAGANDA", to further the Agenda of the Chacon Political Machine ........, with litigious consequences. Normally, the INSPIRATION for our "Ask a Fake News/Propagandist Muckraker Feature", would make himself available to answer the QUESTIONS GALORE regarding today's Weekly's Missive , but as stated through Legal Counsel ......, "I am very busy, one-man show here. I write, sell, design the paper, collect bills, send out bills, IT, customer service, distribution manager." in promoting the, NOW-documented "Brian Hews/Los Chacon Hews". Thus, we will rely on comments from his Counsel, or other alleged personas-----Scott Johnson. Mayor Sam LACCD Exclusive, Part Two: Trustee Steve Veres (along with Board allies and State Senator K.A. Leon's) BOUGHT SILENCE on Pacifica Service's Past Inappropriate Employee Conduct? In Part Two of our Mayor Sam LACCD Exclusive, we disclose how apparently, Pacifica Services BOUGHT THE SILENCE of NOW Board of Trustee Member Steve Veres in regards to its past BIGOTED, SEXIST and INAPPROPRIATE CONDUCT while engage in alleged Contract Services with the Central Basin Water District. 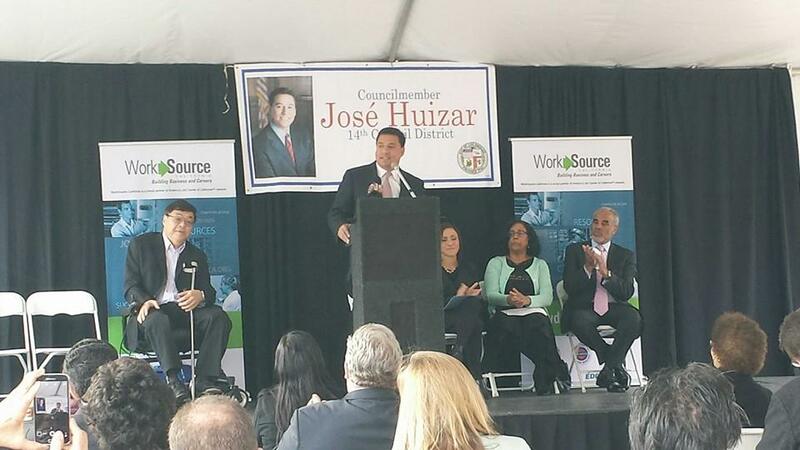 How will LACCD Board of Trustee Member (and State Senator K.A. Leon Staffer) explain his BOUGHT SILENCE regarding past Pacific Services Bigoted Employee Conduct? Top executives at Pacifica Services and officials within the Central Basin Municipal Water District (CB) exchanged thousands of highly racist emails during a three-year period that disparaged Muslims, Palestinians, Hispanics, Blacks, Asians, Seniors, naked woman, obese people, liberals, immigrants, Wal-Mart shoppers, rednecks, gays and lesbians. As we noted yesterday in Part One of our Mayor Sam Exclusive regarding the GROWING LACCD Bond Oversight Contract Controversy, Pacific Services was, THEE major Special Interest Contributor to the FAILED Veres CD-4 Campaign .......... and four years later, the, NOW LACCD Board of Trustee Member (again) , is seeking (with Boss K.A. Leon's support) to "SILENTLY" reciprocate the owed Political Favors. In a Mayor Sam Exclusive, we disclose an attempted Los Angeles Community College District (LACCD) Construction Bond Oversight Contract "PUTSCH" by Trustee Steve Veres (with political backing via Boss State Senator Kevin Alexander of Leon) to benefit his (and Boss) MEGA donors at the NOTORIOUS (and FBI investigated) Pacifica Services. Will Trustee Steve Veres and (K.A. Leon) turn the LACCD into an Education Version of the Central Basin Water District ..........., with the help of Pacifica (and Jacob) Services? It should be time to say SAYONARA to any future political aspirations for Unlawful Cubafornia State Senate Presiding Officer Kevin Alexander of Leon (aka. K.A. Leon) as The Sanctuary State Bill Author invites Pacifica Services (and his Appointee to the High Speed Rail Commission) Ernest Camacho, on a Junket to Japan. From the Facebook Page of State Senator Holly Mitchell: State Senate Presiding Officer K.A. 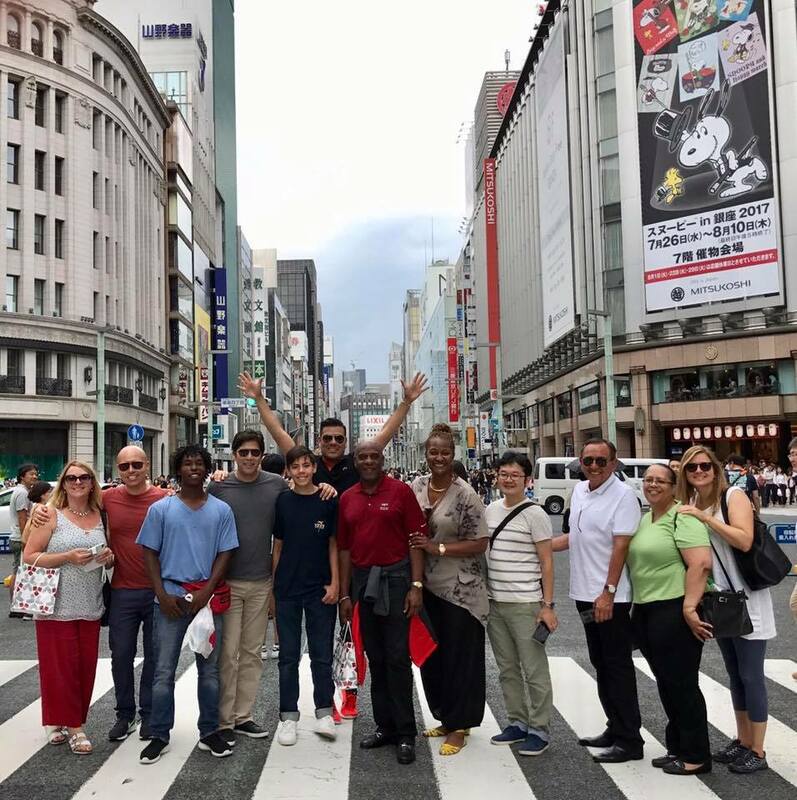 Leon (in gray t-shirt) and Ernest Camacho (third from right in white shirt) in Japan with other members of the Cubafornia Junket Delegation. ** Blogger's Notes: A bloggin KONNICHIWA to all, especially to Unlawful State Senate Presiding Officer Kevin Alexander of Leon (aka. K.A. Leon, or the Politico Self-branded as Kevin De Leon), ......, and his Junket Companion Ernest Camacho of Pacific Services. K.A. Leon appointed the Pacifica CEO to the California High Speed Rail Authority Board of Directors last Spring. 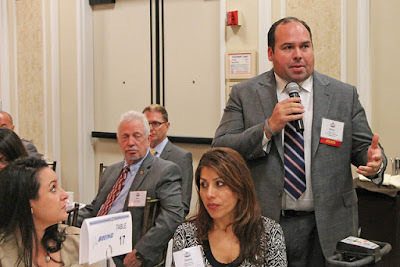 Thus, one can surmise that Camacho spent his time in Japan absorbing information on recent incarnations of the famous Bullet Trains .......... and pondering how his company can someday replicate its past Central Basin Water District Billing/Handout Practices, in garnering some future spoils. A Just Because Edition of .......... "Ask a Fake News/Propagandist Muckraker, featuring Brian Hews"
After a brief hiatus, the Mayor Sam Blog returns to its "Ask a Fake News/Propagandist Muckraker, featuring Brian Hews (of the formerly Los Cerritos Community News)" .........., just because (of pending SERIOUS ethical and legal issues). Our Fake News/Propagandist Muckraker Brian Hews is ALL smiles (or in denial) in prepping answers to your questions (with guidance from The Chacon Political Family). 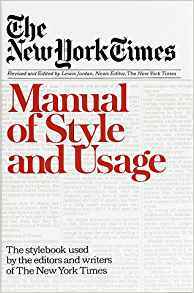 The Style Bible for Fake News/Propagandists .........., with Ethical (and pending LEGAL) Issues. With no apologies to a certain "Ex Blameless (HAHA!) Wife of Bill Clinton Presidential Candidate", the Mayor Sam Blog commences a BLOGGIN RESET, that expands our political musings beyond our normal 200 Spring Street-centered coverage ............, without ABSOLUTELY any pre-conditions. We are Hitting The Bloggin Reset Button .........., with ABSOLUTELY no accommodations to the Local, State and National Political Establishments (of BOTH Parties).